Are you worried about lack of disk space? Are you still troubled by how to find and delete the files those duplicate exist in the same or different hard discs. Take it easy, there is a free duplicate cleaner to solve it, which I found it by luck. 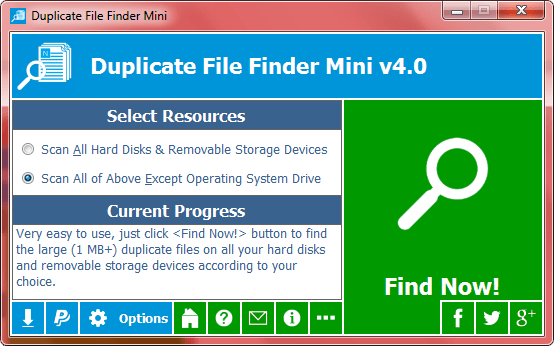 Now, let’s follow me to experience how the freeware - Duplicate File Finder Mini works. How to Exploit the Gold Mine - Find Duplicate Files Free! As we see, the interface is concise to the most, and it is so smart just correspond to his name –Mini, that’s why I fell in love with it when I glanced at it for the first time. You have only two different choices, except whether cover the Operating System Drive or not, there is no any difference between them, which one you are going to select depending on your requirement, the system default is the latter – Operating System Drive is not included. I always remain it unchanged because the producer highly recommends us not to modify it to protect our system security. A Bigger Gold Mine - Fast Free Duplicate Cleaner! Then, click the <Find Now!> button at the bottom right to find duplicate files free in your computer – WHAT! It is extremely fast, the result presents in front me just like my finger touched the button right now! Screenshot 2: the result interface of the outstanding freeware - Duplicate File Finder Mini. There are a series of operation buttons on the top of the Duplicate File Finder Mini Result dialog box, you can deal with the highlighted files by using them, and the row of Filter provide you with the function to limit the range of file size showed in the face of you, the column of Statistics and Tips also offer us some information about the result. What is also worth noticing is that: this free duplicate file finder compares files by size in bytes, so it is not 100% accurate, but you can visit the homepage of Duplicate File Finder Plus to get the 100% exact edition. Download the Software to Find Duplicate Files Free Now!